THE MARINE REGISTER is announcing a deadline of June 30 for listing company data in the next annual edition. 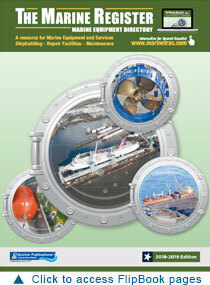 The companion website marinetrac.com has expanded the scope of coverage with an increased show of web traffic. Data analysis recorded for the six-month average ending March 2019 projects over 50,000 annual visitors in 2019. If you wish to be included in the 2019-2020 edition please click here to register. Procurement Postings is an Electronic Messaging Service open to visitors from the fifty plus countries that search the marinetrac website for equipment, marine related products and services. An automated online postings system is available through our enrollment process. 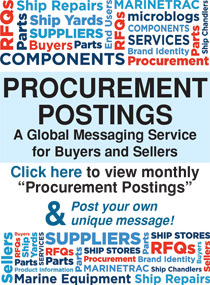 Click to visit the Procurement Postings page. Other options include marketing plans, primarily to promote sales in marine markets, for companies that register in our database. Harnessed by SEO programs, a product search performed by a buyer, through the “Product Categories” index within our system, will identify the names of related supplier companies, and links to their websites. The online “Product Categories” index lists over 6,000 classifications of equipment and components used in the building of ships and other waterborne carriers. Additions to the Index will cater to the needs of the Environment and Ocean Technology sector. The ongoing expansion of this site includes a growing presence of marine services providers, offering onboard ship repairs, and offsite subcontracting services to Shipbuilders, Commercial Fleets, Vessel Owners and Operators. Click on Equipment Search to check your company data. Contact us for editing your current data, and for other relevant information.